The Lovato RGK Parallel Automatic mains failure gen-set controllers are capable of automatically switching to a generator power source and starting the generator in the event of a failure in the electrical mains. The RGK series of gen-set transfer switches are also able to supervise the operation of contactors as well as motorised circuit breakers and changeover switches in open transition. In addition, it has programmable inputs, outputs and alarms, and is also compatible with Lovato Synergy software which enables remote control and supervision of the unit. – Menus for quick selection of rated parameter settings. – “Autocall” function for automatic sending of emails and/or SMS at predefined events/alarms. – Mains (for RGK900 only) Generator controls: Phase sequence, phase loss, voltage asymmetry and max/min voltage and frequency. – Programmable maintenance at various intervals. – Current leakage control towards earth/ground. – Mains-generator synchronising (ATS closed transition). – Mains in base-load with generator in peak shaving. – Paralleling supervision of generators (island mode). – Generating set start scheduling. – VAC Inputs: Mains L1-L2-L3-N for RGK900 only. – VAC Inputs: Generator L1-L2-L3-N.
– Voltage measurement rated value: 600VAC (UL/CSA). – Voltage measurement range: 30-720VAC. – Frequency measurement range: 45…65Hz or 360…440Hz. – Current measurement input (3 PH+N): 0.05-6A or 0.05…1.2A. – Fourth CT for neutral measurement or earth/ground leakage detection. – Graphic LCD, 128×112 pixels with backlight. – 3 relay outputs rated 8A 250VAC. – 6 static outputs rated 2A, protected. – 1 static output 50mA. – Engine running detection: “D+” generator voltage and frequency. – 1 engine speed input: “W” or “Magnetic Pick-up”. – 3 analog ohmic inputs for oil pressure, engine temperature and fuel level control. – 1 programmable analog input. – 2 analog outputs for engine speed control (governor) / voltage regulator (AVR). – Alarm-event-parameter text in 5 languages (Web upload). – Alarm text customisable (16 alarms). – Modbus-RTU, Modbus-ASCII and Modbus-TCP communication protocols. – Boolean logic for inputs, outputs and internal status. – Customisation manager software available; compatible with Synergy and Xpress software. – Degree of Protection: IEC IP65 on front; suitable for use with UL/CSA Type 4X outdoor enclosure installation. – Sleep function (power saving mode). – Synchronising and load sharing. RGK900SA Stand alone controller, paralleling control among generating sets. 12/24VDC, graphic LCD, RS485 port and USB/optical and Wi-Fi point programming port on front. Expandable with EXP… modules, 1.040kg. 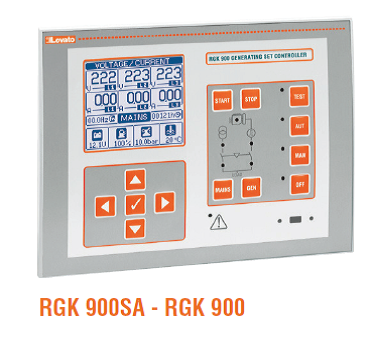 RGK900 AMF (Automatic Mains Failure) controller, mains generator paralleling control. 12/24VDC, graphic LCD, RS485 port, USB/optical and Wi-Fi point programming port on front. Expandable with EXP… modules, 1.040kg. RGK900MC Mains-ATS (Automatic Transfer Switching) controller, control of mains, automatic transfer switching (ATS), and paralleling on multiple generators controlled by RGK900SA. 12/24VDC, graphic LCD, with RS485 port and USB/optical and Wi-Fi point programming port. Expandable with EXP… modules, 1.040kg.